Each child will go through many transitions in their school experiences. At Flowerdale Primary School we pride ourselves on ensuring that these transitions are as smooth as possible, with each child being supported and fully prepared for the next stage of their learning journey. We are fortunate to have the Flowerdale Kindergarten on the same site as our school. This ensures that kindergarten children are fully prepared for their Foundation year at school because they have already had many visits to our F-2 classroom throughout the year. They will visit our F-2 regularly and the Foundation students will also enjoy return visits back to their kinder. The next major transition is the transition from primary to secondary school. Most Flowerdale students will journey to Yea High School for their secondary education. 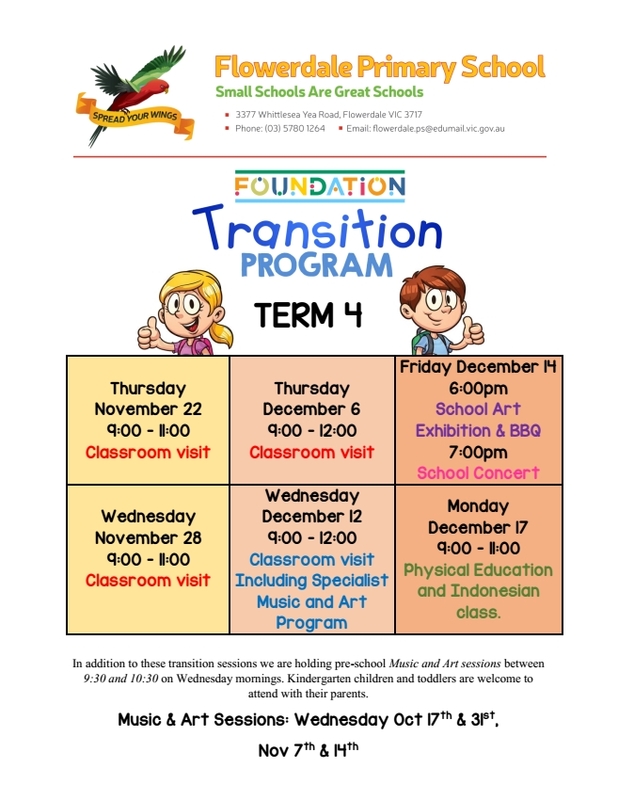 There are many transition activities planned throughout the year in order to fully prepare our year 6 students for this next stage. The High School will bring former students back to our school for a presentation and later in the year Flowerdale students have opportunity to ride the school bus down to Yea for two separate days of preparation and learning. This is always a highlight of their year 6.